I entered St Mary’s Abbey, Glencairn when I was 28 years old after working in the area of media and before that, studying english literature at University College Dublin. I did not overtly consider the idea of a vocation when I was growing up and going to school in Dublin. This was in the eighties. Nobody did, or so I thought! But an awareness of the importance of God in my life and the desire of somehow sharing that relationship with others, was stirred in my depths during the time I spent at college. Studying english, I found, became a privileged way to discover insights into the lives of writers who had tried, themselves, to articulate the spiritual experiences of their own lives and my heart and mind were expanded and I was inspired by them. Being true to my own depths began to be the challenge for me now. My knowledge of monastic life had been awakened when I was a child. My father had gone to school in Mount St Joseph Abbey, in Roscrea and had maintained his link of friendship with the monks who lived there. I had always been touched by their presence and their monastic way of life. Their radical commitment to God and their generous, loving and hospitable fraternity were very attractive to me. Later, in my twenties on my travels, I came across a Cistercian monk of this community who was on a sabbatical year in Berkeley, in the United States. Again, I felt that old attraction; his life, as it were, given to God seemed to make sense to me at a deep level within and I felt the old call to be true to myself. When I returned to Ireland, I began my search in earnest, re-visiting the Abbey in Roscrea and discovering as an adult the truths revealed by faith and the beauty of the monk’s worship and their communal dedication to God. There too I was introduced to scripture and the gospels at a new level of meaning and into my hands was placed the Rule of St Benedict by a monk who had himself made the monastic journey and could speak so eloquently of its power to transform one’s life. On one such weekend there, I met a Cistercian nun of Glencairn, and there and then I resolved to visit her community and find out what monastic life was like for women. The state of tension and fear in which I arrived at the monastery on that first visit was soon relieved by the welcome sight of wide open fields and crops glinting in the evening sun, some homey touches at the guesthouse – including the warm hug of the Guestmistress sister at the door – and the singing of the nuns at Compline in the Abbey church – “’What can bring us happiness?’, many say, ‘lift up the light of your face on us, O Lord’.” (Psalm 4) But it was the silence that spoke to me most of God’s loving presence and call and I began to consider for the first time my own Cistercian vocation. It took me two more years to make up my mind to apply to enter Glencairn and with that decision came at once both a sense of coming home and a setting forth. For although we enter the monastery understanding that we are called as Cistercians to take a vow of stability to remain in this one place, it is well to understand at the outset that we will not be standing still! 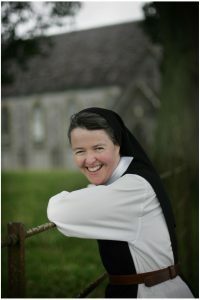 Monastic life, I have come to learn, is a journey through my humanity to that profound encounter with God’s mercy in my weakness and the joy of discovering Christ at an intimate level in my life, in the life of the community to whom I am given and in the life of the world for whom I am interceding in prayer, worship and self-gift. My rootedness then as a Cistercian has been ultimately sustained by my rootedness in Christ, the one attachment through whom I will paradoxically find the freedom to embrace all. I have always loved the image of the mustard seed from the gospel as a portrayal of the kingdom of God: the potential of such a small, insignificant seed to grow to full expanse so that all the birds of the air can shelter in its branches.